Vitamin Z were an English pop group, formed in 1982 by vocalist Geoff Barradale and bassist Nick Lockwood. Their lone hit "Burning Flame" charted well in the UK, but no further hits caught on. Geoff Barradale now serves as manager for the Arctic Monkeys. Vitamin Z founders Geoff Barradale and Nick Lockwood were born and raised in Northern England’s Sheffield. The group originally took shape around a loose-knit collection of local musicians who came together in a common rehearsal space. 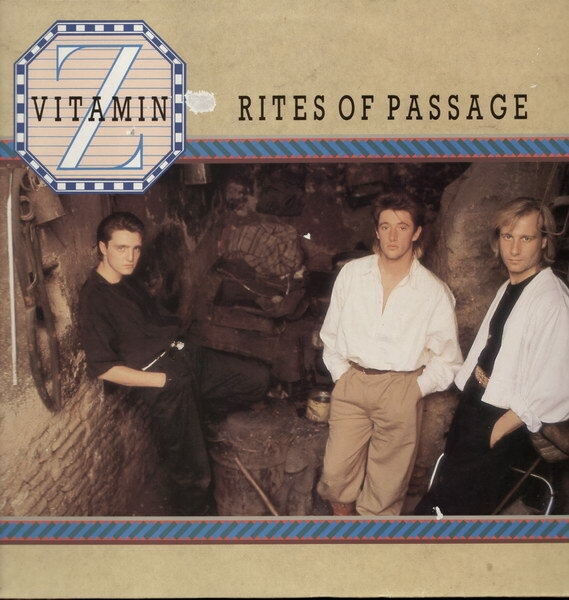 The band's debut album Rites Of Passage, was released in 1985. Its most prominent single, "Burning Flame," did well on the U.S. dance charts and the band toured England with Tears for Fears. Vitamin Z also made news when its video for the song "Circus Ring (We Scream About)" filmed in Istanbul, making them the first Western Europeans to be allowed to film in Turkey since Midnight Express prompted government officials there to close the border to foreign film units. A year or so further on and the follow-up album was ready to go. "But we sat down and listened to it and it didn't do anything," recalls Barradale. "If it didn't move us, it wasn't going to move anybody else. The songs were good, but the treatment was wrong, contrived, plastic. We see ourselves as far more edgy, spiky. It was the wrong marriage with a producer." While they awaited the results of a lawsuit that would hopefully allow them to re-work the songs, they wrote a number of new ones. They liked what they were hearing so much that they paid for another demo out of their own pockets. "We knew," says Barradale, "that this was our moment. We had to take it." By the time the legal matters were settled, they were already in the studio working on Sharp Stone Rain, beginning with producer Pete Smith (Sting, The Adventures) but ended up co-producing tracks. Also seizing the moment, Lockwood decided to move from bass and keyboards to guitar. "In a songwriting sense, it's more creative being able to write on the guitar". Barradale appeared on The Alan Parsons Project album Gaudi released in 1987. He sang lead vocals for the "Standing On Higher Ground" lead off single. Vitamin Z recorded demos for a third album, which was never released. Barradale continued to record and perform from his native Sheffield, teaming up with guitarist and songwriter Alan Smyth, later a producer based at his own 2-Fly Studios in the city. Their bands Fruit, Seafruit, were championed by Jeff Cooper (broadcaster)'s 'XS' show (now radio2XS) at the radio station Hallam FM, where they recorded two sessions in 1996 and 1997. Cooper also employed Barradale as the narrator of a 1995 radio documentary for the BBC 'Sheffield Music 1995', which also featured Pulp's Jarvis Cocker and others. Barradale is currently the manager of the city's Arctic Monkeys.